Writing in 1865, A. Newton remarked that "the exterminating process is generally one that excites little or no attention until the doom of the victim is sealed." Indeed, few people seem to be aware that the Scottish wildcat was almost wiped out by human persecution at the beginning of the last century and that the species is still at risk from a less aggressive but potentially more dangerous enemy - the domestic cat. The popular view of the Scottish wildcat is of a snarling, flat-eared demon, with all its weaponry of teeth and claws set for battle. This fierce animal was chosen as the symbol for several clans including the powerful Clan Chattan (or Cat) federation, while the motto of the MacPhersons is "NA BEAN DO'N CHAT GUN LAMHAINN" - in English "Touch not the cat but a glove". The motto is a warning to those who would be so imprudent as to approach the wildcat (and by implication a MacPherson) when his claws are unsheathed or "ungloved". 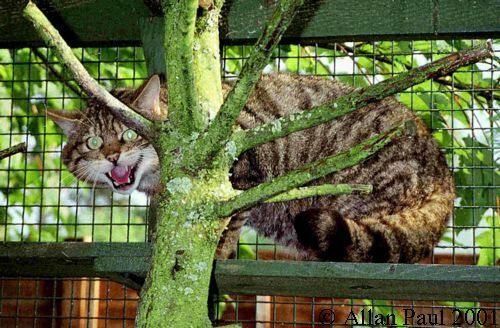 The extremely ferocious nature of the Scottish wildcat is actually a myth, perpetuated by taxidermists, artists and photographers who, for dramatic effect, have portrayed a cat at bay, cornered, caged, or so terrified that it has to unleash its total armoury in self-defence. Wildcats do, of course, bristle and snarl, flatten their ears and hiss explosively - just like domestic cats. However, most of the time they just pad around with their ears unglued from their skulls and their claws and teeth safely locked away - again like a domestic cat. Since the extinction of the larger carnivores from Scotland, the wildcat has no natural predator, yet it very nearly became extinct, directly as a consequence of human persecution. In post-glacial times, there have been two main causes for the extinction of animals in Scotland. The first is habitat change, especially deforestation, while the second is human persecution, by fur trappers, collectors and especially by gamekeepers. It is difficult to over-estimate the importance of game preservation in the last 150 years as a factor controlling the wildlife population in Scotland. Grouse moors came into existence around 1850 and after this date gamekeeping became extremely intensive with "vermin" including the wildcat, polecat and pine marten, taking heavy punishment. Since historic times, almost all extinctions in Scotland have been the result of human persecution. The popular belief is that some time around 5,000 bp, Neolithic man wiped out the Lynx, which was then native to Scotland, however carbon dating of Lynx bones reveals that the species survived into the early centuries of the first millennium. (As a native species, recent lynx sightings in Scotland cannot strictly be included in those of "Alien" Big Cats.) In the last thousand years, no less than nine native mammals have become extinct in Scotland. The brown bear disappeared in the 10 th century, and the reindeer in the 12 th. The 14 th century saw the extinction of the Aurochs or wild ox and the elk, while the beaver became extinct in the 16 th century and the wild boar in the 17 th. There are many stories concerning the killing of the Last Wolf in Scotland, Sir Ewan Cameron having killed the last wolf in Lochaber in 1680, while tradition has it that the last Scottish wolf was killed by a Macqueen in 1743. The most recent victims were the red squirrel, which became extinct by about 1810 and the polecat, which was last sighted in 1912. There have been some successful re-introductions however. The red squirrel was reintroduced into Midlothian in 1772 and Perthshire in 1790, and although still at risk, few people now realise that red squirrels were ever extinct in Scotland. Another success story is the reindeer which was reintroduced in 1952, and there are now three herds numbering 70 - 80 individuals. Following studies by Scottish Natural Heritage the European Beaver will be re-introduced. While there is much talk of re-introducing the wolf, hostility among stock owners makes this unlikely in the near future. It is widely assumed that wildcats have never been native to the remote Scottish islands, however, they were once widespread throughout the rest of the British Isles. In most of the south of England, the wildcat was extinct by the 16 th century. Deforestation resulting in a reduction of wildcat habitat may have been responsible for this disappearance. However, as well as preying upon preserved game animals, the wildcat was also accused of attacking both chickens and lambs, and this, as much as deforestation, may explain its early disappearance from the south. Officially the last wildcat in England was seen in Northumberland in 1853, however a pair were shot on the Lancaster-Westmoreland border in 1922. In Wales, where accurate records are lacking, the wildcat lingered on in several counties (Breconshire, Cardiganshire, Radnorshire, Merionethshire and Caernarvanshire) before becoming extinct between 1850 - 1870, with the last reliable record from Abermule, Montgomery in 1862. Some authors considered the wildcat was still present in 1900, and some believe that wildcats or their cross-breed descendants still survive in Wales today. In Scotland the wildcat became extinct in the Lothians before 1800 and by 1830 it was absent from almost the whole of the south of Scotland and from Nairn, Moray and Banff. In Dumfries and Galloway, the last wildcat was killed at Balmaangan in 1810 or 1820. The final wildcat bastion in the south was Berwickshire where they had been numerous in the 1800s, the last animal being sighted near Old Cambus in 1849. By 1882, there were no wildcats to the south of Argyll and Perthshire, where they were confined to the most remote and mountainous regions. The last wildcat in Aberdeenshire was killed in 1875 in Glen Tanar, and by 1882 the wildcat was becoming scare in Inverness-shire. Only in the far north, in Ross, Cromarty and Sutherland was it still abundant. In 1887 the wildcat was reported to be declining in Sutherland and in 1904 it was regarded as rare in Ross. In 1920 the wildcat was reported to be still present in Wester Ross, Sutherland, Inverness and Argyll, but the authors were not optimistic about its future. The wildcat looked set to follow the polecat and disappear from the list of Scottish fauna. Ironically, it was the outbreak of war which ultimately saved the Scottish wildcat from extinction, when many gamekeepers left the estates to fight in Flanders in 1914. Since the end of the war there has been a gradual decrease in activity by gamekeepers and the wildcat has been spreading south again. Unfortunately, records for this post-war period are sparse compared to the intense interest in Natural History which characterised the Victorian and Edwardians eras. However, from the available records it is clear that the wildcat reacted very quickly to the relaxation of persecution. By 1919 the wildcat had become re-established in Perthshire after an absence of 19 years and by 1935 it had recolonised Stirlingshire, Banffshire, and Dunbartonshire. It reappeared in Moray, Nairn and Aberdeenshire between 1920 and 1946, and Kincardineshire and Angus between 1946 and 1962. The wildcat has also started to expand south of the Clyde and Forth with a sighting just 40 miles from Edinburgh in 1963 and another in Lanarkshire in 1971. The wildcat had survived the threat to its existence which was posed by gamekeeping and is now protected by law. However, the wildcat is still under threat from another animal - the domestic cat. Interbreeding between domestic cats and the wildcat is believed by many to be a recent problem. When persecution was reduced after the Great War of 1914 - 1918 the wildcat population started to expand and recolonise areas south of the Great Glen. The theory was that the small population in the newly colonised areas provided few readily available mates from the same species and that crossbreeding with farm cats became common resulting in a mixed population. (Note that, strictly speaking, "hybridisation" as defined scientifically by Gray in 1971 occurs between separate species and results in infertile offspring. As wildcats and domestic cats belong to the same species, Felis silvestris, cats of mixed parents are "crossbreeds" or "interbreeds" rather than "hybrids".) In its 1987- 1988 report, the British Nature Conservancy Council reported on its study into interbreeding and concluded that as a result of less intense persecution, wild cats were increasing in Scotland, where they had been all but exterminated by 1900. However, as long as wildcats were confined to remote areas their genetic integrity was probably secure, as the wildcats were unlikely to come into contact with domestic cats. Geological evidence suggests that there were only three glacial periods in Britain compared to four in northern Europe, the Alps and North America. The last, or Devensian period began about 70,000 years bp (before present). At its maximum extent (20,000 - 18,000 bp) the ice front covered the whole of Scotland with the possible exception of Caithness and Aberdeenshire. The ice began to melt rapidly about 13,000 bp and Scotland was free of ice from 13,000 - 11,500 bp. From about 12,000 bp, however there was a decline in temperatures and glaciers redeveloped in the Western Highlands, being termed the "Loch Lomond Readvance". At about 10,000 bp the last Ice Age ended quite abruptly. It is at this time that many of Britain's native animals, including the wildcat, are believed to have crossed the land bridge from Europe. The sea level rose rapidly from -40 to -20 metres between 11,000 bp and 8,500 bp and then more slowly to reach the present sea level at about 5,500 bp. It is believed that England was cut off from Europe at about 8,500 bp. At this point British mammals (with the exception of bats) became isolated from their counterparts on mainland Europe. The British wildcat has therefore been isolated from the European wildcat for 8,500 years. Evidence for the existence of the wildcat in Scotland in prehistoric times is based upon bone remains in the mud from some small lochs in Angus. The wildcat was probably an inhabitant of southern and mid Britain for some time before it arrived in Scotland. One of the first records of the wildcat in Scotland is from Sir Robert Lindsay's Chronicles of Scotland in 1528 where he relates a hunt organised for King James V by the Earl of Atholl where many animals were killed including "small beastes such as roe, woulffs, foxes and wyld cattis." while in 1630, Sir Robert Gordon mentions that the forests of Sutherland were full of "Wyld Cattis". The first description of a Scottish wildcat is by Sir Robert Sibbald, Physician and Geographer to King Charles II in his "Scotia Ilustrata, sive Proromus historiæ naturalis" of 1684. He described the domestic cat as "Felis animal familiare ac domesticum. Leoni non dissimile facile ac dentibus et unguibus. In tenebris illi fulgent radiantque Oculi." and the wildcat as "Felis sylvestris major est domestica, densiore et longiore pilo, colore fusco, variato, cauda crassiore. Aviculis vescitur, Lepusculis," etc. Scientists use Latin names to define species of animals following the system devised by the Swedish naturalist Linnaeus. He defined the domestic cat as Felis catus in 1758, while the northern or European wildcat was classified as Felis silvestris by Schreber in 1777 and the southern or African wildcat was named Felis lybica by Forster in 1780. Over the past 240 years, ideas have changed greatly, with some taxonomists favouring "lumping" species together and other in favour of "splitting". The taxonomy of the various wildcats has been complicated and confusing (Table 1) but it is now generally accepted that domestic cats and African and European wildcats are groups or "subspecies" of a single, widely distributed species. The current nomenclature is Felis silvestris catus for the domestic cat, Felis silvestris silvestris for the European wildcat and Felis silvestris lybica for the African wildcat. Problems exist with the current nomenclature, however - as the domestic cat (Felis catus Linnaeus 1758) was named first, the correct nomenclature should strictly be Felis catus catus, Felis catus silvestris and Felis catus lybica, respectively. 1) gradually and continually since the arrival of the domestic cat, 2,000 years ago. 3) following the Highland Clearances when domestic cats may have been left behind. "It would seem that the original Wild Cat, as found in the early historic times as well as in the Middle Ages, has for a long time been quite extinct in this country, its place being taken in the first instance by a mixed breed, in which the hereditary strain of the original wild race predominated. Later on, as the imported domestic race increased in numbers and localities, this was superseded by a still more modified form of the domestic cat, in which the foreign characteristics of the ancestral progenitors of the domestic race, viz. the African cat, were in the ascendant and prevail up to the present time." Hamilton also writes "Most authors who have written on the natural history of this animal state that there are certain well-known characteristics which distinguish it from the domestic variety. It has been found, however, that, on examining a number of specimens of both races, these so-called specific characteristics are as often found in the tabby forms of Felis catus domestica (i.e. domestic cats) as in Felis catus ferus (i.e. wildcats), and cannot be considered as representative, but are caused by the interbreeding of the two races for a long series of years." Therefore, there is clearly a problem as to exactly how to define a "true" Scottish wildcat. Unfortunately, there are severe doubts about the validity of the "type specimen" which was chosen. A Scottish wildcat which was trapped at Invermoriston in 1907 was presented to the British Museum. Despite the concerns of Hamilton and other authors, this cat was used as a "type specimen" by which all other Scottish wildcats were judged. In 1912 Miller used this single cat to define the Scottish wildcat as a separate subspecies Felis silvestris grampia, different from the European counterpart, Felis silvestris silvestris, on the basis of its darker coloration and well-defined stripes on its sides and legs. In 1951, Pocock went even further and defined the Scottish wildcat as a separate species, Felis grampia. The Invermoriston cat was subsequently used as the gold standard for the Scottish wildcats and only cats which resembled it were acceptable for inclusion in museum collections as "Scottish wildcats". Any cats not resembling the original were rejected and thus almost all cats present in collections are similar animals. 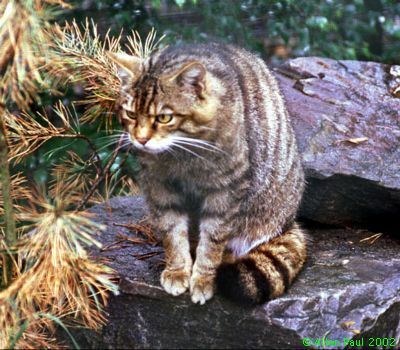 This is extremely unfortunate as the rejection of other wildcats as "atypical" or "hybrids" gives a completely false impression that the natural population was uniform and resembled that of the Invermoriston cat. There are no less than 665 wild cat skins at the Museum of Natural History in London, almost all of which resemble the Invermoriston cat. (The British Museum has the largest collection of Scottish wildcat skins in the world, with the next biggest being 85 skins at the Royal Museum of Scotland in Edinburgh.) Unsurprisingly, when these skins, collected by a method of "unnatural selection" were compared with wildcats from the natural population, many cats have been defined as "hybrids" on the basis that they did not resemble cats which resembled the original Invermoriston cat - which, if Edward Hamilton's concerns are justified, may itself have been a cross-breed. This has resulted in an unfortunate misconception as to what actually constitutes a "wildcat". Clearly there was a need to re-assess the validity of the Invermoriston type specimen and the baseline against how a "true" Scottish wildcat should be defined. Not everybody agrees, however, that the Invermoriston cat is a bad type specimen. Dr. Andrew Kitchener of the Royal Museum of Scotland remains confident that the type specimen Felis silvestris grampia reflected distinct characteristics for distinguishing wildcats from domestic cats. Dr Kitchener also believes that wildcats and domestic cats can be distinguished by using, amongst other criteria, a test on the mandible which shows that the wildcat's jaw bone can be made to stand upright whereas a domestic cat's can not. One particular case of interest concerns the black felids which were named "Kellas cats" after the village in Moray where several specimens were found. As far back as 1938, Scottish Field Magazine published a report of an untameable feral cat including a photograph of what appeared to be a Kellas cat. In 1984, a jet black cat with flecks of silvery white fur on its hindquarters was found dead in a fox snare at Revack Lodge. The gamekeeper who caught the cat stated it had a rather pointed nose, long limbs and pronounced canine teeth. Two years later in 1986, a similar cat was shot dead in Kellas in Moray while in May 1986, a cat was captured alive in Moray and filmed by a BBC camera crew. Another Kellas cat was spotted in the south at East Kilbride in 1993, swimming after wildfowl. It was shot by a gamekeeper after standing up to his two dogs. Black felids similar to Kellas cats have also been reported in Transcaucasia in 1904 when they were defined as a new species, Felis daemon, which was renamed Felis silvestris caucasica in 1973. Di Frances, an expert on Kellas cats, has described an individual caught by a gamekeeper in 1988. "It was the size of a very large Scottish Wildcat, but there the resemblance ended. The trapped cat had a slim muscular body, long legs and a long whip like tail. The coat was short and pure black, the chest deep, the hind quarters powerful, but the most striking feature was the head. The animal looked in profile like a hybrid between a cat and a rabbit. The skull was long, the brow sloping down into a pronounced Roman nose, the cranium was flat and broad, the ears large and pricked with a leathery appearance. The jutting upper, jaw overshot the lower jaw, the canine teeth were very long, the lower angled to fit into grooves in the upper jaw, the upper teeth protruding below the lower jaw. The cheek bones were high and broad, giving the creature an almost oriental appearance." Karl Shuker, in his "Mystery Cats of the World" has suggested that Kellas cats represent a new or incipient species of wild cat, which is involving cheetah-like adaptations for increased cursoriality. The new taxon was characterised by a black pelage interspersed with prominent white guard hairs, a small head and relatively long limbs compared to wild or domestic cats. This possibility was investigated by Kitchener and Easterbee who in 1992 reported the conclusions of their studies on three Kellas cats. 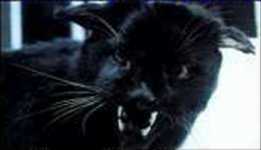 They maintained that in fact the Kellas cat had shorter, not longer legs than domestic cats. Their conclusion was that "the Scottish black felids known as "Kellas" cats are introgressive hybrids between wildcats, Felis silvestris, and domestic cats, Felis catus, carrying a variable proportion of wildcat genes. Felis daemon of the Caucasus may represent a similar hybrid form." However, the conclusions drawn by these researchers do not exactly concur with the results which they present in their article. In fact, on the basis of cranial capacity, cranial index, gut length and gut index, the three Kellas cats all fall within or very close to the norms for wildcats rather than domestic cats. It is only when the authors' own "discriminant analysis" (French et al. 1988) is applied that the Kellas cats "key out as hybrids". Unfortunately the results of this analysis are not presented. Indeed, Balharry & Daniels in their 1998 report state reservations about the "French" method: "There are two fundamental concerns about this approach; firstly, it is assumed that the skulls assessed represent "genuine wildcat material" yet the authors themselves state in their introduction that "most 'wildcat' specimens in museums were collected during this century and hybridisation may have been occurring over several centuries". Secondly, the material from each time period comes from different areas and consequently classification may simply determine how similar a skull is to a wild living cat from a particular area." Sarah Hartwell has stated that Shuker's suggestion of a "self-perpetuating strain of notably large hybrids" is unrealistic, since "continued interbreeding would restore the smaller sized norm" and the suggestion that non-native genes will lead to an "unpredictable addition to the British ecosystem" is also described as "faulty" "since the new genes would be diluted by interbreeding with the native population. Domestic cats will simply assimilate the non-native genes, from whatever source, as they have done throughout their long evolution." However, where the non-native animals predominate or in an isolated population where an exotic male breeds with his hybrid daughters and grand-daughters, there could be a real shift in the gene pool. Whether members of this new gene pool is considered to represent a new species, subspecies or breed is a matter of debate for scientists. One thing, however, is certain. When scientists have been unable to agree even as to what constitutes a true wildcat, it is unsurprising that the taxonomic status of the "Kellas cat" remains inconclusive. But does all this really matter? Who cares if wildcats are pure-bred or hybrids? Well, actually the law does. In the USA, the Department of the Interior ruled that hybrids are not protected by the Endangered Species Act. This has caused considerable concern for animals like the Florida panther (Felis concolor coryi) which are on the verge of extinction. This is a subspecies of puma (or cougar) and carries genes from pumas from central America which were introduced several decades ago. The Florida panther is, strictly speaking a hybrid, and can not therefore be protected by USA law. In 1994, when it was confirmed that American red and grey wolves have interbred with coyotes, calls were made to end funding for their conservation. The problem is that legislation is designed to protect rare species rather than rare genes and that judges, rather than scientists, now decide upon matters such as the definition of species and subspecies and which animals may be legally protected. Again, one might argue that what happens in the USA does not concern us here in Scotland where wildcats are no longer under threat. In fact, a study by Stahl and Artois in 1991 revealed that while there was "no threat" to the Scottish wildcat from habitat loss, hybridisation posed a "threat" and persecution continued to pose a "significant threat" to wildcat survival. Even more worrying, the population status was found to be "declining". "Wildcats" ("cat, wild Felis silvestris") have been protected since 1988 when the Wildlife and Countryside Act of 1981 was revised. Despite this, wildcats can still be killed without fear of prosecution. At Stonehaven Sheriff Court on 24 th May 1990, a defendant was acquitted of charges of killing three wildcats because an expert witness could not say "beyond reasonable doubt" that the animals were indeed "wildcats". In order to remove this loophole in the law, in 1992, a proposal was therefore made to the British Government by the Joint Nature Conservation Committee that "wildcat hybrid (of wildcat appearance)" be added to the schedule of animals protected by the 1981 act. The proposal was not accepted and therefore the Scottish wildcats, of which less than 3,500 individuals are believed to remain, have no legal protection. Ironically, while wildcats, a protected species, are still persecuted, the killing of domestic cats is frowned upon, especially when they have Royal connections. In 1997, a gamekeeper from the Invercauld Estate shot a tortoiseshell cat belonging to the Rev Robert Sloan, of Crathie Church, where the Queen worships when at Balmoral. In this case, the gamekeeper was reprimanded, ordered to apologise to Rev Sloan, and told to study the difference between domestic and feral cats. If the gamekeeper did indeed make a serious study of the subject, he might have been excused for concluding that any morphological differences would be impossible to define. The future is not entirely bleak for the Scottish wildcat however. Scottish laws are no longer decided by the British Parliament at Westminster where few MPs realised, let alone cared, that Scotland has its own separate legal system. Since 1999, Scotland has its own devolved parliament which has the time and inclination to examine Scottish solutions for Scottish problems. In June 2000, the Scottish Environment Minister, Sarah Boyack, announced her intention to publish a policy statement on wildlife law reform and Dr Sam Galbraith, who replaced her in November 2000, has confirmed this intention. Meanwhile our concerns about the legal status of the Scottish Wildcat have been taken up by Phil Gallie MSP, the Convenor of the Cross Party Animal Welfare Group of the Scottish Parliament who has written to the Scottish Justice Minister, the Rt Hon Jim Wallace MP MSP, drawing his attention to the issue. Concerning the controversy as to whether the present Scottish wildcat is a cross-bred animal, Balharry & Daniels state "This is a somewhat academic debate and should not affect the conservation value of the "wildcat". After all whether large or small, domestic or wild, both groups are descendants of the same ancestral field. What is of conservation value is that to survive in some areas of Scotland, the selection pressures are such that some of the traits favoured in the process of domestication may be selected against." The last quotation must also go to Balharry & Daniels who conclude "The flawed logic behind taking an animal whose ancestors could have been interbreeding with domestic cats for anything up to 2,000 years and using it to define the markings of a "wildcat" resulted in a misconception of what constitutes a "wildcat" that has continued up to the present day. The psychology behind this is likely to be that humans do not like uncertainty and are driven by a desire to compartmentalise animals into groups that can be easily understood. The results from the SNH study and their interpretation, do not lend themselves to casual summary and in the absence of further analysis, the desire to draw firm conclusion should be resisted, lest we inadvertently initiate another century of misconception." Clearly, the debate about the status of the Scottish wildcat is set to continue for some time to come. *The protocol followed, when grouping animals previously described as a species into subspecies, is to give precedent to the species name of the animal described first and use the latter named species to form the subspecies names. Technically Felis catus has taxonomic precedent but there is debate as to whether domesticated animals should receive scientific names. The Caucasian black cat, Felis silvestris caucasica Satunin, 1905. Wild living cats in Scotland. Scottish Natural Heritage Research, Survey and Monitoring Report No 23. Variations in coat colour gene frequencies and selection in the cats of Scotland. Morphological discriminants of Scottish wildcats (Felis silvestris), domestic cats (F. catus) and their hybrids. Journal of Zoology. 161: 75-123. Endangered species and the law. The wild cat of Scotland. The Annals of Scottish Natural History. 6: 22-78. Domestic X Wild Hybrids In The Wild. The past and present distribution of some of the rarer animals of Scotland. I The wild cat. The Zoologist. (series 3) 5: 8-23. Is survival of European wildcats Felis silvestris in Britain threatened by interbreeding with domestic cats? Some observations on Scottish Wildcats (Felis silvestris) based on the results of autopsies. Recovery plans for British mammals of conservation importance, their design and value. The taxonomic status of black felids in Scotland. Journal of Zoology (London) 227: 342-346. The origins of the domesticated forms of the genus Felis (mammalia). The decline of the rarer carnivores in Great Britain during the nineteenth century. Catalogue of the mammals of western Europe (Europe exclusive of Russia) in the collection of the British Museum. London. Catalogue of genus Felis. British Museum (Natural History), London. Multivariate analysis of craniometric characters in European wild cat, domestic cat, and African wild cat (genus Felis). Genetic variability and biochemical systematics of domestic and wilcat populations (Felis silvestris: Felidae). Journal of Mammalogy. 72: 79-88. The black wild cat of Transcaucasia. Proceedings of the Zoological Society of London. 1904: 163-164. Mystery cats of the world: From blue tigers to Exmoor beasts. The Scottish wildcat, Felis silvestris grampia. Status and conservation of the wildcat (Felis silvestris) in Europe and around the Mediterranean rim. Convention on Wildlife and Natural Habitat Conservancy in Europe. Strasbourg, October 1991. 61 pp. The wild cat (Felis silvestris) in Great Britain. Journal of Animal Ecology. 15: 130-133. When did the mammal fauna of the British Isles arrive?